Caught in a trap in the middle of the woods, a bald eagle would've surely died if nobody saw or did anything, but two brothers wouldn't let that happen. 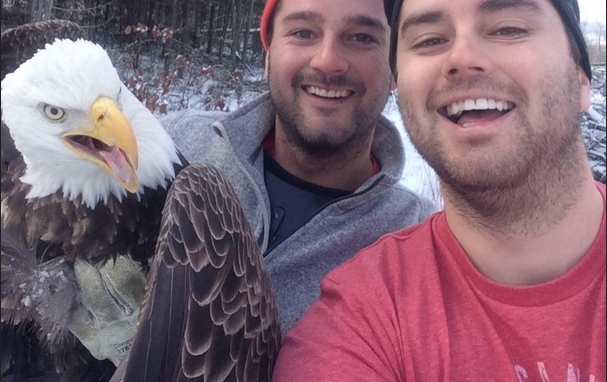 While out on a hunting trip off Windy Lake in Ontario, two brothers, Michael and Neil Fletcher, spotted the eagle, chained to the ground. The two brothers, both in their late 20s, briefly considered calling the Ministry of Natural Resources and Forestry but felt it was more important to free the bird right away, and then contact the ministry. Michael said he tugged off his hoodie and placed it over the raptor's head while they pressed on the release mechanism of the trap. "Me and my brother just kind of held onto it, and it calmed right down," he said. Responses to "Trapped Bald Eagle Owes His Life To These Heroic Brothers "